In popular culture, we often think of innovation as the work of a few visionaries with world-changing ideas, such as Steve Jobs. But when it comes to “how innovation actually happens in the real world,” as Jobs biographer Walter Isaacson notes in his book, The Innovators, “we have far fewer tales of collaborative creativity, which is actually more important in understanding how today’s technology revolution was fashioned” (Isaacson 2014). We can see ‘collaborative creativity’ throughout the automotive industry supply chain. Much innovative work is being done daily by suppliers throughout the industry in the form of hands-on efforts by engineers and non-engineers to identify problems and find practical solutions. They work both independently and also collaboratively with their automaker customers. In recent papers, we’ve explored the benefits of such collaboration – and problems that occur when it is lacking (Helper and Kuan 2016, Helper and Krueger 2016, Helper and Henderson 2014). Supplier engineers are responsible for innovation in a variety of value-creating and cost-reducing products and processes, from new chemical compounds to complex dies and stamping processes. This kind of innovation is difficult to measure, and the people doing the work often don’t recognise their efforts as innovation, but rather as low-tech tinkering. Nonetheless, they contribute solutions that improve products and processes throughout the industry, creating significant value for their companies and their customers. In the spring of 2011, we surveyed of thousands of firms in the automotive supply chain operating in the US (Helper and Kuan 2016). The plants varied by size, geographic location, and industry, and included both domestic and foreign-owned firms. We spoke with engineers, production workers, plant managers, sales managers, and human resource managers, and visited large and small firms in various parts of the country. These firms ranged from metal-working and assembly operations to chemical, rubber, and electronics companies. We found an industry dominated by a few enormous firms, supported by thousands of small- and medium-sized enterprises. Tier-1 firms, which supply automakers directly, represented just under a quarter of our sample. The rest were ‘lower-tier’ firms, which supply other suppliers. Some mega-suppliers have many billions of dollars in annual sales, almost all of which come from direct dealings with automakers; lower-tier firms tend to be much smaller. In smaller firms, we found that a company’s only engineer might engage in one or more activities such as R&D, product design, and process engineering, all in a single day. A third of our survey respondents produced only products designed by their customers, while about 15% produced only parts that they design themselves. The rest, a majority of the firms, fall somewhere between these two extremes. About a third of the suppliers indicated that they typically begin production on at least one new component every year. The introduction of new products designed by clever engineers is clearly a useful form of innovation. For example, a chemical supplier we visited, which had several patents for rubber additives, reported that one of its more profitable offerings was its ‘cake mix’ product line. Managers at the firm had noticed customers would buy the same combinations of chemicals, which they would have to measure and mix themselves. The company decided to offer easy-to-use, pre-mixed packages of these chemicals, which would help ensure more consistent outcomes for their customers and higher profits for the firm. Inventive improvising can also result in valuable innovation. At one factory we visited, an engineer had created a machine by cobbling together parts from two older machines that were not being used. The new machine was able to produce an item that the customer had been purchasing from a Chinese competitor, but at a higher quality and with a faster delivery time than the overseas version. Process innovation can generate cost reductions through fewer errors or more reliable equipment. For example, one metal stamper bought a large press capable of stamping inch-thick material, which was much thicker than the sheet metal that their current machinery was capable of punching through. This stamper was able to produce a part that was previously made by casting, a much more costly and energy-intensive process involving pouring molten metal into a mould. At another supplier, process engineers added welding capabilities to the firm’s production technologies. This allowed the firm to make a part using two stamped pieces that were joined together by welding. The welded assembly replaced a more costly cast part that its customer was importing. At many supply firms, engineers and technicians constantly experiment and develop new processes as part of their everyday maintenance of existing production lines. While these activities by themselves may seem relatively unimportant, even to the engineer, they can result in incremental innovations that reduce costs and create value for customers. When aggregated across the thousands of firms that make up the auto industry, they constitute a phenomenon of economic importance. The auto industry is increasingly relying on suppliers not only for manufacturing but also for innovation. 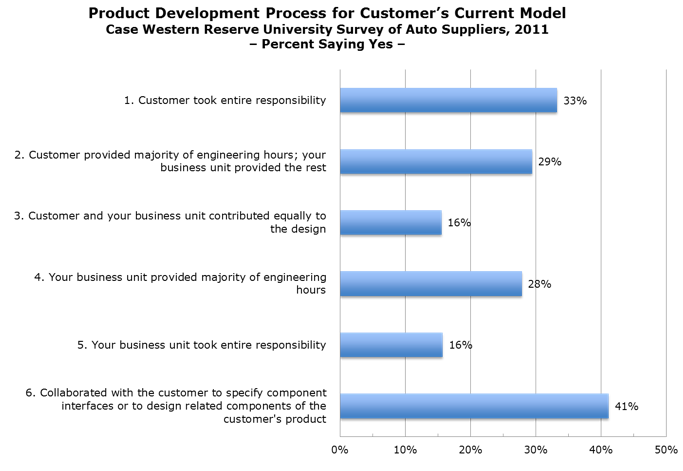 In 2011, 70% of auto suppliers who responded to our survey said they contributed to the design effort, compared with 48% in 1989. However, smaller suppliers are often a weak link in the innovation eco-system (Helper and Krueger 2016). A scarcity of resources arguably promotes the clever but cheap innovations described above. However, small suppliers often lack the capital to invest in more expensive forms of innovation. Collaboration with customers can be sporadic. For example, a well-known technique for improving designs is ‘Value Analysis/Value Engineering’, in which customers and suppliers jointly review each component of a product or step of a process, and ask whether the value provided could be delivered more efficiently. The chemical company’s cake-mix product was an outgrowth of this collaborative approach. Despite the potential of this technique, however, only a third of suppliers said they used it with their customers. Many of the firms in our study expressed a distinct preference for Japanese customers, who were valued for their fairness and willingness to invest in ‘relational contracts’ with suppliers. A great deal of literature on Japanese sourcing practices shows how Japanese automakers provide training and management assistance to suppliers, in return for ‘continuous improvement’ in costs and performance (Womack et al. 1990, Helper and Henderson 2014). German customers were also viewed as fair by our interviewees, but less involved than the Japanese in the improvement and investment of their suppliers. By contrast, US automakers were viewed as making unreasonable demands for regular price reductions and offering little technical or organisational support. In the 21st century, as innovation becomes increasingly valuable and engineers are likely to enjoy an ever-broadening range of opportunities, US automakers may find it hard to attract new innovators to their industry if they do not provide their supplier partners greater assurance that they will receive some form of return on investments they make in innovation, and improve mechanisms for information sharing. Improved relational contracts such as these would deepen the collaborative creativity we already see in the industry, strengthening the entire industry and helping to move technology forward. Helper, S and R Henderson (2014) “Management practices, relational contracts, and the decline of General Motors”, Journal of Economic Perspectives, 28(1): 49–72. Helper, S and T Krueger (2016) Supply chains and equitable growth, Washington Center for Equitable Growth. Helper, S and J Kuan (2016) “What goes on under the hood? How engineers innovate in the automotive supply chain”, in R B Freeman and H Salzman (eds), Engineering in a Global Economy, Chicago: University of Chicago Press. Isaacson, W (2014) Steve Jobs, New York: Simon and Schuster. Womack, J, D Jones and D Roos (1990) The machine that changed the world, New York: Rawson.